While cross referencing headstones and a Leamington (New Zealand) cemetery burial map I found four World War One soldiers without headstones. The Year of the Veteran in 2006 was the ideal opportunity to get government funding of $2000 to put this matter to rights. Fred Keeley died 1 July 1950, Gerald Murtagh died 14 March 1951, Don McKinnon died 23 August 1952, Bert Higgins died 4 August 1956. With the help of Waipa District Council’s sexton Dean Signal and cemetery staff, I was able to have these headstones lain with the soldiers, near the Colonial Soldiers’ Memorial at the far end of the cemetery. Waikato Stonecraft Ltd trimmed the bottoms of the stones as we laid them flat, in keeping with the headstone of L.N. McKinnon already in situ. 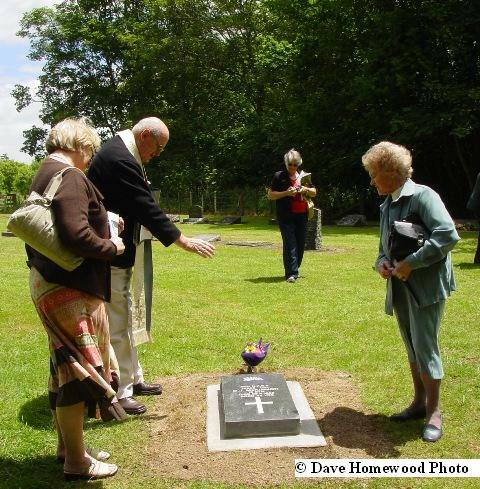 Descendents of all the families rallied for the unveiling as they were thrilled to have found their relatives’ lost plots and to have them recognised. The Returned Services Association helped with the formalities and Rev. Geoff Crawshaw performed the blessing.